Scott Lynch, formerly a senior financial executive at Red Thread Spaces LLC, the New England workplace solutions provider, has joined the leadership of Colonial Systems, Inc. in the position of Chief Financial Officer. 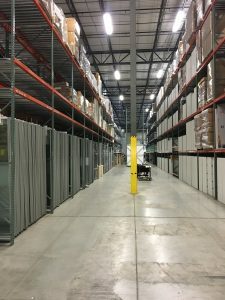 Colonial Systems is an interior specialty contractor providing installation, storage, delivery and asset management services for contract furniture and movable wall systems in New England. As Vice President of Finance at Red Thread for the past 10 years, Scott was responsible for the complete spectrum of the Finance function, including planning and forecasting, internal and external financial reporting, sales compensation development and oversight, real estate management, payroll and SOX oversight. He served Red Thread, formerly known as Office Environments of New England (OE), for a total of nearly 21 years. OE recruited Scott to the position of Financial Reporting Manager in 1995 based on the strengths of his audit and tax work and, in particular, his assistance with OE’s merger with OUI and Business Interiors in 1994 while a Senior Auditor in the Boston office of Arthur Andersen LLP. Scott was the Controller at OE from 2000 to 2006 and subsequently served for a little more than five years in the dual role of Controller and Vice President of Finance. He supported OE’s continued expansion during this 11-year period through a series of business acquisitions within the New England region. In 2010 and 2011, Scott was integrally involved in Office Environments of New England’s acquisitions of Business Interiors of NNE and BKM Total Office of CT. The resulting entity, Red Thread Spaces, is a wholly owned subsidiary of Steelcase, Inc. and a Steelcase Platinum Partner dealership. Scott is a 1990 graduate of Assumption College, where he earned a BA in Accounting. A soccer player during his college years, Scott is now an outdoor enthusiast, a Ragnar and half-marathon runner, and an avid cyclist who has participated in the Pan-Mass Challenge 11 times. He and his wife of 24 years have two sons and live in Franklin, Mass. 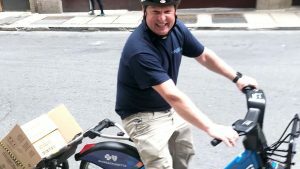 Colonial Systems installation foreman Kevin O’Rourke is a frequent user of the Boston region’s Bluebikes bike sharing system for both business and leisure activities. In a much different form of bike sharing, he’s an avid competitor along with his 8-year-old husky, Faith, in the sport of bikejoring. Joe Doran has joined Colonial Systems as a senior account manager responsible for project execution, oversight of selected major accounts, and estimating. Adding Joe to our management team reflects a strategic emphasis on expanding Colonial Systems’ ability to support dealers with excellent customer service. An enterprise asset management solution developed by Colonial Systems for a large regional health plan went into full-scale operation in late June. The solution integrates Colonial’s database configuration, warehousing and delivery capabilities with the cloud-based SnapTracker™ life-cycle management application.